Clean the trout fillets. Peel and dice the onion. In a large pan melt 1 soup spoon of margarine. Mix the remaining margarine with the flour and set aside. Add the onions to 100 ml water. Cook the fish fillets in this mix then remove them when cooked. Add the cream and the mixed flour and margarine and bring to a boil stirring constantly. Season with salt and pepper. Run the paste through the food processor one more time and then add it to the pan, stirring it into the mix. Drain the potatoes. 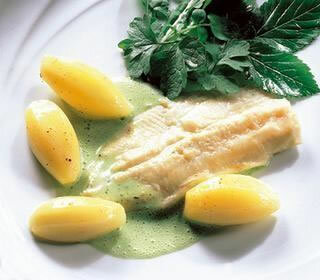 Arrange fish fillets and potatoes on individual dinner plates and pour sauce over the fish. Serve.